Shelf containing many books about the NWMP, RNWMP and RCMP. 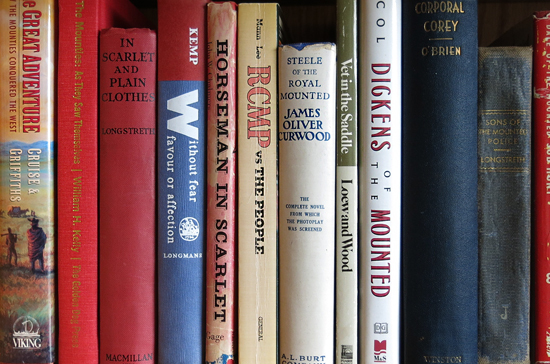 Since the creation of the RCMP, there have been hundreds of fiction and non-fiction books published about the North West Mounted Police, Royal North West Mounted Police and the Royal Canadian Mounted Police. 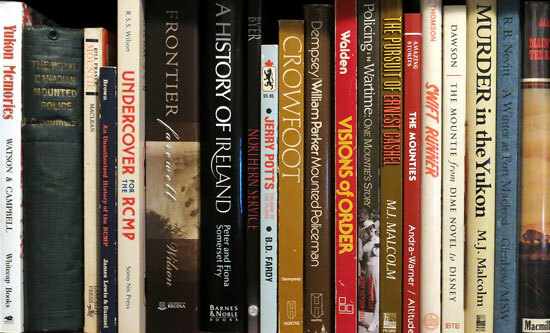 Over the past few years, there has been a flood of books about the RCMP and policing in Canada. On our website, we have posted some of these books for the information of our website visitors. New Book: At the Mountain’s Edge – written by Genieve Graham. Check out the link to purchase this book. New Book: An Element of Risk – written by Don Easton – Check out our webpage on this book here. Death And Other Stories – From Red River Carts To Peggy’s Cove – written by David Nadeau. The North-West Mounted Police: 1873-85 – written by Jack Dunn – Check out our webpage on this book here. Twice As Far: The Swissair 111 Airplance Crash Investigation – The Shocking True Story Of Deception & Corruption Behind The Hangar Doors – written by RCMP Veteran Thomas C. Juby. – Check out our webpage on this book here. Mounties On The Cover – RCMP Veteran Al Lund – Check out the link to purchase this book.. Shattered Illusions: KGB Cold War Espionage In Canada – RCMP Veteran Donald G. Mahar – Check out our webpage on this book here. Silenced: The Untold Story Of The Fight For Equality In The RCMP – RCMP Veteran Dr. Bonnie Reilly Schmidt – Check out our webpage on this book here. Second Careers For Street Cops: Use your Experience As A Police Officer To Start A Second Career, A Practical Guide For Law Enforcement Officers by VPD Veteran John Eldridge. – Check out the book review here. Red Coat Diaries: True Stories From The Royal Canadian Mounted Police – edited by Constable Aaron Sheedy – Check out the book review here. Through Midnight Sapphires Into My Scarlet Heat – by RCMP Veteran Sherry Williams – Check out more details here. No One To Tell: Breaking My Silence On Life In The RCMP – by RCMP Veteran Janet Marlo – Check out more details here. RCMP Manual of Horsemanship – by RCMP Veteran Donald Klancher – Check out more details here. Souls Behind The Badge: The Real World Of Policing – by RCMP Veteran Wayne Ryan – Check out more details here. Spying 101: The RCMP’s Secret Activities At Canadian Universities, 1917 – 1997 – by RCMP Veteran Steve Hewitt – Check out more details here. The Thinner Blue Line: The Life & Times Of A Dedicated Customs Officer – by Barry M. Risk – Check out more details here. Victoria Cross: For Daring & Conspicuous Acts Of Bravery – by the Royal Canadian Legion – Check further details here. In The Mind Of A Mountie – by RCMP Veteran T.M. ‘Scotty’ Gardiner. Law Of The Yukon: A History Of The Mounted Police In The Yukon – By Helene Dorowolsky. No Easy Ride: Reflections Of My Life In The RCMP – by RCMP Veteran Ian T. Parsons. Red Serge And Polar Bear Pants: Biography of RCMP Member Harry Stallworthy – by William Barr. This is Not The RCMP I Joined: The RCMP Pension And Insurance Scandal – by RCMP Veteran Ron Lewis. The Caloris Rim Project by Glenn MacDonald – Check out more details here. When new books are published, we will endeavour to include them on this list.